Pathology- n- an abnormality or deviation from normal. So, these are our roots, but what does it mean? 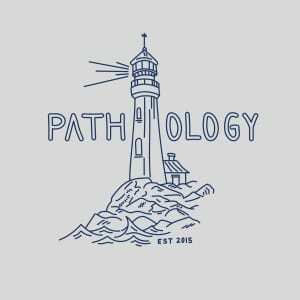 In the Physical Therapy world, we label any injury as a pathology. For instance, a torn rotator cuff can be labeled as a shoulder or rotator cuff pathology. So, why name a brand after this idea? We believe that we are not only called to be different from the norms of society, but we are to embrace abnormality. We are called to live in the world, but to keep high eyes and humble hearts as we run through this life. We are astronauts here, taking a few skips and leaps before returning home. But this isn’t some promise that everything will be rainbows and butterflies. We believe that in training and in our lives, we are promised suffering, but rather than shy away, we should pursue thorns, because they provide meaning and purpose which cultivate joy in our lives. Our prayers go out with each and every item sold, and we proudly support missionaries and the movement of the gospel. 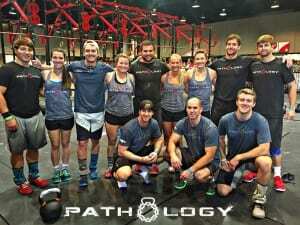 If you would like to use Pathology Apparel for support raising, please contact us as pathologyapparel@gmail.com. Our goal with each logo is to generate a subtle, yet defining theme that will serve not only as a constant reminder of true purpose to the owner, but will also provide ample opportunities for meaningful conversations and explanations to others.  The Kettle Crown symbolizes our roots in the fitness/crossfit community, and is a kettle bell meshed with a crown of thorns. 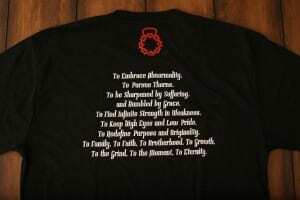 We love this design because it embodies our ideals to lift up our weaknesses to shoulders much more broad than our own. We are often willing to pound our bodies into submission to grow physically and competitively, but the same ideals of facing our weaknesses stand true in our faith. So go and pursue thorns. The DNA Double Helix is a reminder that eternity is written into our hearts. We are not made to stay here, nor are we made to conform to the world’s ideals. Break free from the routine, train and live without boundaries, and explore eternity. Path Embrace has become one of our taglines because it literally encompasses everyone. We all have a path before us with many twists, turns, failures, and successes; however, all the flavor in life is found in the journey. Luckily, we have a blueprint that has been laid out through the perfection and propitiation of Christ, so we are truly free to embrace that gift and whatever trials come our way. The Mountains to Sea logo is relatively new, and it’s one of our favorites (along with every other logo). Our roots started in the mountains of Western North Carolina, and our journey has now led us down by the bay in Lower Alabama. Along with our background as a company, we want to appeal also to our vulnerability. If we can imagine the height of our failures and sin as a mountain, and the depth of our failures and sin as the sea, by the grace of the path of Christ, it’s all been covered. In this way, we are free to explore eternity each and every day. The Fisher of Men logo was inspired by a popular fish in Lower Alabama called the red drum. While we are proud supporters of fishing and the outdoor life in general, this also appeals to our opportunity to become fishers of men! 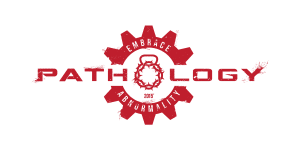 The Pathology Baseball/Softball logo was inspired by my career in baseball. Competing every pitch was one of the philosophies we adopted at Troy University, and I think it’s one of the best ways to play the game. Not only are we called to compete every single pitch in baseball, but we should also approach our lives in this way, facing every slice of adversity with eternity in mind. Baseball is an incredible avenue for God to teach through, so keep your eyes open. Be humble, and remember that there is a purpose and a finish line, and we have the freedom to compete every pitch along the way to get there. The Parachute Penguin logo was originally created as a complete joke. Fortunately, the idea quickly caught on and found it’s way onto our team shirts for a Crossfit competition. What’s not to love about a penguin who believed and then found a way to fly? The Lighthouse logo has always been a popular image in my home. Thanks to the creative artistry of Chad Woody (Slow Wide Turns), we could bring this idea to life. We have never been, nor will we ever be the light of the lighthouse; we are just the structure that God uses to spread the light of his Love. Through different stages in our lives we often alternate roles between lighthouse and the ship that is relying on the light to make it safely to shore. Steer clear of the rocks, stand strong through the storm, and always remember the source of the light.